1.1.5 you are carrying out the Process as a Consumer (as defined below) and (without limitation) ordering the Products for your own exclusive use. 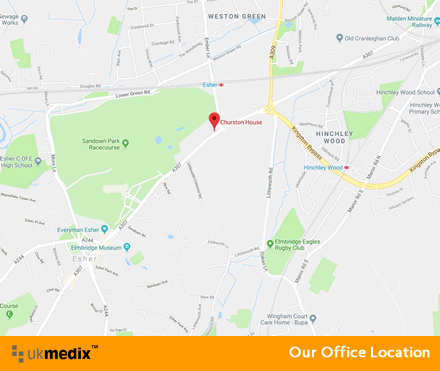 1.2 All dealings with us, the Prescriber (GMC Registered Physicians) and the Pharmacist/The Seller (UKMedix Pharmacy GPhC 9011005) through the Website are made subject to these terms. 1.3 We may vary these terms from time to time at our discretion. To do this we may publish revised terms on the Website and from the time of publication we, you, the Prescriber (GMC Registered Physicians) and the Pharmacist/The Seller (UKMedix Pharmacy GPhC 9011005) shall be bound by the terms as revised. 1.4.1 You will indicate by completing the appropriate form on the Website the Products that you wish to order. For the purposes of these terms that shall constitute a conditional order placed by you with us subject to the successful completion of the steps described in Clauses 1.4.2 to 1.4.7. At the same time you will complete an authorisation for us to recover, through your credit card, payments due to us. The payment that you make shall include the price of the Products and any professional fees (including without limitation those payable to the Prescriber (GMC Registered Physicians) and the Pharmacist/The Seller (UKMedix Pharmacy GPhC 9011005)) that we may incur in relation to your order. 1.4.2 You will be asked to complete online an appropriate medical questionnaire. On the questionnaire you will be asked to give details of your regular doctor and to authorise the Prescriber (GMC Registered Physicians) and the Pharmacist/The Seller (UKMedix Pharmacy GPhC 9011005) to contact him or her � and to authorise him or her to contact the Prescriber (GMC Registered Physicians) or the Pharmacist/The Seller (UKMedix Pharmacy GPhC 9011005) or both - in relation to your medical condition in the context of the proposed order. You need not give this information or authority if you do not wish to, but, if you do not, that may mean that the Prescriber (GMC Registered Physicians) will decline to prescribe for you the Products that you wish to order. 1.4.3 The Prescriber (GMC Registered Physicians) will consider your response to the questionnaire and determine whether to prescribe for you the Products that you wish to order. The Prescriber (GMC Registered Physicians) may ask you or your regular doctor further questions by email or by such other medium as you authorise in your response to the questionnaire. You need not answer any such further questions if you do not wish to, but, if you do not, that may mean that the Prescriber (GMC Registered Physicians) will decline to prescribe for you the Products that you wish to order. 1.4.4 The Prescriber (GMC Registered Physicians) may then issue a prescription for the Products that you wish to order and shall deliver the prescription to the Pharmacist/The Seller (UKMedix Pharmacy GPhC 9011005). 1.4.5 The Prescriber (GMC Registered Physicians) may reveal to the Pharmacist/The Seller (UKMedix Pharmacy GPhC 9011005) any information about you, whether or not derived from the information that you give in response to the questionnaire. 1.4.6 The Pharmacist/The Seller (UKMedix Pharmacy GPhC 9011005) may ask you further questions by email or by such other medium as you authorise in your response to the questionnaire. You need not answer any such further questions if you do not wish to, but, if you do not, that may mean that the Pharmacist/The Seller (UKMedix Pharmacy GPhC 9011005) will decline to fulfil the prescription. 1.4.7 If the Pharmacist/The Seller (UKMedix Pharmacy GPhC 9011005) determines that the prescription should be fulfilled, he or she shall notify us. Only at that point will your order for the supply to you of Products become unconditional. 1.4.8 This website is hosted by UKMedix Internet Limited, which acts as the agent for the pharmacy owned by UKMedix Internet Limited. 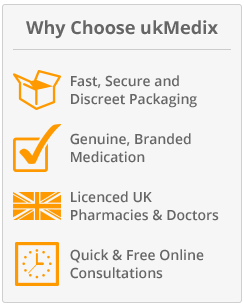 All sales and supplies are made by UKMedix Internet Limited in accordance with medicines legislation. For the avoidance of doubt, your order shall constitute an offer to UKMedix Internet Limited to purchase the Products specified in the order. UKMedix Internet Limited is authorised by UKMedix Internet Limited to accept offers to supply medicines once they have been prescribed. As agent of UKMedix Internet, we may accept or decline the order. If we acknowledge your order that shall not constitute an acceptance of it. If we accept the order we shall notify you of our acceptance (in these terms �Acceptance� by email, and we shall confirm the price. We shall at the same time notify you of the identifying number (in these terms the �Identifying Number�) for your order and you will be required to quote it in any subsequent communications. Only at that point will a contract for the sale and purchase of Products come into being. 1.4.9 If we accept your order we may instruct the Pharmacist/The Seller (UKMedix Pharmacy GPhC 9011005) to deliver the Products to you. In that event, the Pharmacist/The Seller (UKMedix Pharmacy GPhC 9011005) will act as our agent. 1.4.10 If any order by you fails to become unconditional, we shall be entitled to charge an administration fee, which shall be 75% (or such lesser proportion as we may in our absolute discretion determine) that would otherwise be payable by you for the Products. 1.5 It is essential that you read and understand these terms and the instructions given to you as part of the Process. Failure to do so could endanger your life or health. If any point is unclear or if you wish them to be translated into any other language you should contact us using our standard contact forms, provided on this website. 1.6 You undertake as a condition of your order that that any Products supplied to you shall be used only by you. It is essential that they are used only by you; use by anyone else could endanger their life or health. 1.7 It is essential that information that you supply as part of the Process is true, complete and not misleading. If you give false information it may result in medication being prescribed that could endanger your life or health. �we� means UKMedix Internet Limited of Suite 3, Churston House, Portsmouth Rd., Esher, KT10 9AD; And Companies that it sub contracts to. Including GMC Registered Physicians. "Working Day" means a day on which banks are open for business in London, and excludes weekends and public holidays. "you" means an individual requesting the supply of Medicinal Products through the medium of the Website. 3.1 These terms shall take effect from the date that you first start the Process, and shall apply, subject to Clause 1.3, on each subsequent occasion that you enter into the Process. 4.1 These terms constitute the entire understanding between you, the Prescriber (GMC Registered Physicians), the Pharmacist/The Seller (UKMedix Pharmacy GPhC 9011005) and us in relation to the Website. They supersede any other terms stipulated by you, whether in any order or during any negotiations or any course of dealing established between you, the Prescriber (GMC Registered Physicians), the Pharmacist/The Seller (UKMedix Pharmacy GPhC 9011005) and us. 4.2 All descriptions, illustrations and indications of price of Products provided in the Website or otherwise communicated to you are for guidance only and intended merely to present a general idea of the Products. Nothing contained in any such description, illustration or indication of price shall form any part of these terms. 4.3 Nothing in the Website is to be taken as encouragement or advice by us that you should take any or any particular Medicinal Products. That is a matter for the Prescriber (GMC Registered Physicians) and the Pharmacist/The Seller (UKMedix Pharmacy GPhC 9011005). 5.1 The prices of the Products, including associated professional services including without prejudice those of the Prescriber (GMC Registered Physicians) and the Pharmacist/The Seller (UKMedix Pharmacy GPhC 9011005), shall be those specified by us to you from time to time as provided in Clause 1.4.8. Prices quoted on the Website are indicative only. 5.2 Prices include United Kingdom Value Added Tax, if appropriate, carriage and handling. 6.1 We reserve the right at our discretion to decline to accept any order for Products from you. 6.2 Notwithstanding any other provisions of these terms, we may decline to accept, or we may cancel, any order for Products, whether or not payment has been received, by giving notice of non-acceptance or cancellation to you within ten Working Days of receipt by us of the order. If we decline to accept, or cancel, an order for which we have received payment, we shall refund the payment, less a 75% administration fee, but shall have no further or other liabilities. 7.1 Nothing in these terms and conditions shall be read as limiting our liability or that of the Prescriber (GMC Registered Physicians) or the Pharmacist/The Seller (UKMedix Pharmacy GPhC 9011005) for death or personal injury arising from a wrongful act or omission on our part or that of the Prescriber (GMC Registered Physicians) or the Pharmacist/The Seller (UKMedix Pharmacy GPhC 9011005). 7.2 Neither we, the Prescriber (GMC Registered Physicians) nor the Pharmacist/The Seller (UKMedix Pharmacy GPhC 9011005) shall be under any liability for damage, loss or expense resulting from the failure to give advice or information or the giving of incorrect advice or information whether or not due to the negligence of any of us, the Prescriber (GMC Registered Physicians) or the Pharmacist/The Seller (UKMedix Pharmacy GPhC 9011005) or that of any of our respective employees, agents or sub-contractors. 7.3 The liability assumed by us, the Prescriber (GMC Registered Physicians) and the Pharmacist/The Seller (UKMedix Pharmacy GPhC 9011005) under these terms shall be in lieu of and to the exclusion of all other warranties, conditions, terms and liabilities - express or implied; statutory or otherwise - in respect of the quality or the fitness for any particular purpose of the Products or otherwise however arising, except any implied by law that by law cannot be excluded. Nothing in this Clause 7.2 is to be read as restricting the operation of Clause 4.1. 7.4 Except as provided in these terms neither we, nor the Prescriber (GMC Registered Physicians) nor the Pharmacist/The Seller (UKMedix Pharmacy GPhC 9011005) shall be under any liability, whether in contract, tort or otherwise, in respect of defects in the Products or their failure to correspond to specification or sample or for any injury, damage or loss resulting from such defects or failure. 7.5 In no event shall any breach of contract on our part or that of the Prescriber (GMC Registered Physicians) or the Pharmacist/The Seller (UKMedix Pharmacy GPhC 9011005) or tort (including negligence and breach of statutory duty) or failure of any kind on our part or that of the Prescriber (GMC Registered Physicians) or the Pharmacist/The Seller (UKMedix Pharmacy GPhC 9011005) or that of our respective employees, agents or sub-contractors give rise to any liability for loss of revenue or any consequential or indirect loss or damage arising from any cause whatever. 7.6 Any liability whether in contract, tort or otherwise on our part or that of the Prescriber (GMC Registered Physicians) or the Pharmacist/The Seller (UKMedix Pharmacy GPhC 9011005) in respect of any defect in the Products or of any duty owed to you under or in connection with these terms shall be further limited in the aggregate to the repayment of the amount paid by you for the Products in question. 9.1 The copyright and all other intellectual property rights in the Website and all text, artwork, graphics or images to be found on the Website are the sole and exclusive property of us or our licensors. 10.1 If we, the Prescriber (GMC Registered Physicians) or the Pharmacist/The Seller (UKMedix Pharmacy GPhC 9011005) are hindered or prevented from performing our respective obligations under these terms, for any cause beyond the respective reasonable control of any of us or by reason of our respective inability to procure services, materials or articles required for the performance of the contract except at prices higher than those applicable at the date of your order, we may at our sole option delay the performance of, or cancel the whole or any part of the contract. In that event, neither we, the Prescriber (GMC Registered Physicians) nor the Pharmacist/The Seller (UKMedix Pharmacy GPhC 9011005) shall be held responsible for its delay or cancellation or any inability to deliver. 11.1 English law governs these terms. You, we, the Prescriber (GMC Registered Physicians) and the Pharmacist/The Seller (UKMedix Pharmacy GPhC 9011005) submit to the non-exclusive jurisdiction of the English courts. 12.1 We shall deliver Products ordered by you to a courier or postal service of our choice. By accepting these terms, you agree irrevocably to appoint and do appoint the courier or postal service to be your agent for taking delivery of the Products on your behalf, and delivery to the courier or postal service shall be deemed to be delivery to you. 12.2 If you are resident in the UK, we shall wherever applicable, instruct the courier or postal service to deliver the Products to the address in the UK that you give us. 12.3 If you are not resident in the UK and delivery has not already been made in the UK to your appointed agent, delivery to you outside the UK will be made using the most cost-efficient method as determined by us in our discretion. You must supply to us in all orders both the postal and site address. We are not responsible for any local charges, including but not limited to customs and clearance charges. 13.1 Nothing in this Clause affects your rights under Clause 7.1. 13.2 You must inspect the Products as soon as is reasonably practicable after delivery. Within ten Working Days of delivery you shall notify us in detail and in writing of any defect in the Products or of any other complaint that you may have in relation to the Products. If you fail to give notice in accordance with this clause, the Products shall be conclusively presumed to be in all respects in accordance with the order and free from any defect that would be apparent on reasonable examination, and you shall be deemed to have accepted the Products accordingly. 13.3 Subject to the condition in Clause 14, if you establish to our reasonable satisfaction that any Products are not in accordance with these terms or any other contract between us or are defective, your sole remedy shall be limited (as we may elect) to the replacement of the Products or refund to you of the purchase price or, where sums are owed by you to us, the issue of a credit note or a credit card account refund against return of the Products. If we require you to return the Products to us and they are defective we shall reimburse your reasonable postage cost of returning them. 13.4.3 quoting the Identifying Number. 13.5 Queries regarding Products where we notify you of dispatch but they are not received by you must be made within ten Working Days of the date of Acceptance, and the Identifying Number must be quoted. Without prejudice to Clauses 7, 9 or 15, we need not entertain any query made thereafter. 14.1.2 the Products or parts to which the claim relates are returned to us within that period suitably packaged and carriage-paid and, where relevant, in accordance with any particular instructions that we may have notified to you at the time of supply. Returned Products or parts must be accompanied by an advice note stating the Identifying Number and the nature of any claimed defect, together with such further information as we may at the time of supply have stipulated. 14.2 This warranty shall be in lieu of any warranty or condition implied by law as to the quality or fitness for any particular purpose of the Products except to the extent that such warranty cannot be excluded. 15.1 Risk of loss or of damage to, and title to, the Products shall pass to you at the time of delivery of the Products to the courier or postal service as described in Clause 12. 16.1 This Clause sets out the data-processing practices carried out by us through the use of the Internet and any other electronic communications. If you have any requests concerning your personal information or any queries with regard to these practices please contact us at enquries.uk at ukmedix.co.uk. 16.2 We collect personal information from visitors to this website through the use of on-line forms and every time you e-mail us your details. We also collect information about the transactions you undertake including details of payment cards used. We may also collect personal information from your regular doctor as described in Clause 1. 16.3.5 providing you with information about products and services. 16.4 Your card details are encrypted and passed from your browser to your credit-card service provider. 16.5 All our employees and data processors that have access to, and are associated with the processing of your personal information, are obliged to respect the confidentiality of our visitors� information. 16.7 We will disclose your personal information only to the Prescriber (GMC Registered Physicians) and the Pharmacist/The Seller (UKMedix Pharmacy GPhC 9011005). The Prescriber (GMC Registered Physicians) and the Pharmacist/The Seller (UKMedix Pharmacy GPhC 9011005) and we (including their and our respective employees and agents) may disclose your personal information to each other and to your regular doctor if you have supplied his or her details to us and otherwise as specifically provided in these terms but not otherwise. We may disclose your personal information to government authorities or other bodies exercising statutory or supervisory powers, but only if required to do so by law, or to our own professional advisors in strict confidence. 16.9 You have a right to access the personal data held about you. To obtain a copy of the personal information we hold about you, please write to us. Please quote your name and address. Please also give brief details of the data of which you would like a copy: that enables us to identify it more readily. We will require proof of your identity before providing you with details of any personal information that we may hold about you. We will charge to cover the administration costs involved in providing you with a copy of your information. 16.10 Given that the Internet is a global environment, using the Internet to collect and process personal data necessarily involves transmitting data internationally. Therefore, by browsing this website and communicating electronically with us, you acknowledge and agree to our processing your personal data in this way. 16.11 Please tick the appropriate box provided on our website if you wish to receive information about our products or services.